Performers include: Anthony Anderson, Tracee Ellis Ross, Yara Shahidi, Marcus Scribner, Miles Brown, Marsai Martin, and Laurence Fishburne. This family sitcom revolves around an African-American family who are living the American dream — but that may be too much of a good thing for the family’s dad. Andre ‘Dre’ Johnson (Anthony Anderson) considers himself the family patriarch. When he looks at his life, he sees a beautiful wife and four kids living happily in their colonial home in the suburbs. But when he looks a little closer, have the trappings of success brought too much assimilation for this black family? The world he sees has a much different lens than the one he would like his family to look through. Rainbow (Tracee Ellis Ross) is an anesthesiologist and the bi-racial wife of Dre. He disagrees with some of her liberal viewpoints but they’re in agreement that they want to raise their kids in a better situation than what they had. Much to her husband’s wonderment, she believes their children can exist in a colorless society. She wants her husband to become the first black senior VP of his ad firm and she’s also looking forward to the salary increase that will follow. At 15 years old, Zoey (Yara Shahidi) has everything going for her. She’s pretty, popular and super smart. However, she is dripping in privilege and unearned entitlement. Her idea of success is rooted in material things, rather than hard work. Dre’s son is Andre Jr. (Marcus Scribner) but he asks to be called “Andy.” He also announces that, like his schoolmates, he wants a bar mitzvah for his 13th birthday. Trouble is, their family isn’t Jewish. When the boy says he wants to play for his school’s field hockey team instead of basketball, Dre wonders if he’d prefer Andre play basketball instead. Diane (Marsai Martin) and Jack (Miles Brown) are the six-year-old twins. Jack is more of the sensitive type and idolizes his dad. Diane is gifted and talented and she thinks she has all the answers. Dre’s father (Laurence Fishburne) is affectionately referred to as “Pops.” With an affinity for velour tracksuits and going to the racetrack, Pops can be a curmudgeon and takes every opportunity to offer his opinion on family issues. What do you think? 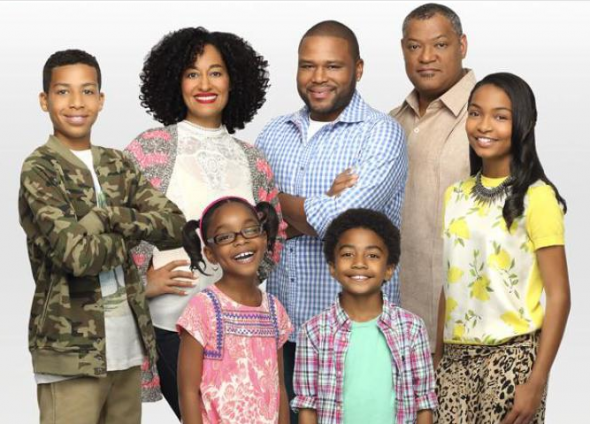 Do you like the Black-ish TV show? Do you think it should be cancelled or renewed for another season? Love this show! I hope it continues to educate and make us all laugh.